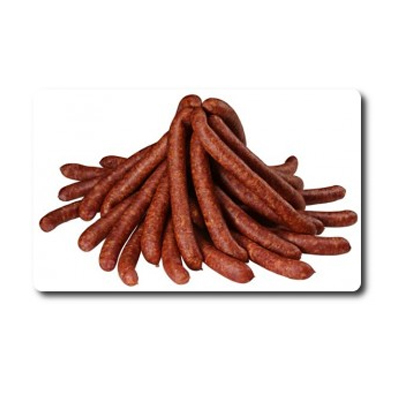 Landjager,is a semi-dried sausage traditionally made in Southern Germany, Austria, Switzerland and Alsace. They are made of roughly equal portions of beef and pork with lard, sugar, red wine and spices. They are each six to eight inches in length, made into links of two. Prior to smoking and drying they are pressed into a mold, which gives them their characteristic rectangular cross-section of about one inch by half an inch. In Austria, Landjager are sometimes made using horsemeat. They are popular as a snack food during activities such as hiking. They also have a history as soldier's food because they keep without refrigeration and come in single-meal portions. 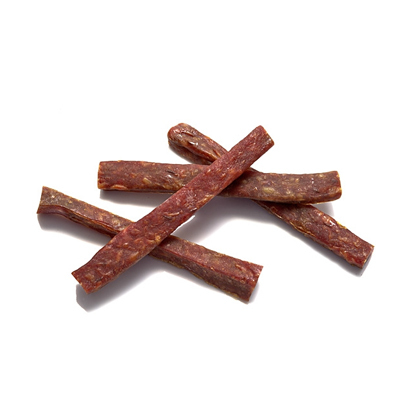 Landjager tastes similar to dried salami. As a meal, landjager sausage can be boiled and served with potatoes and fresh greens.